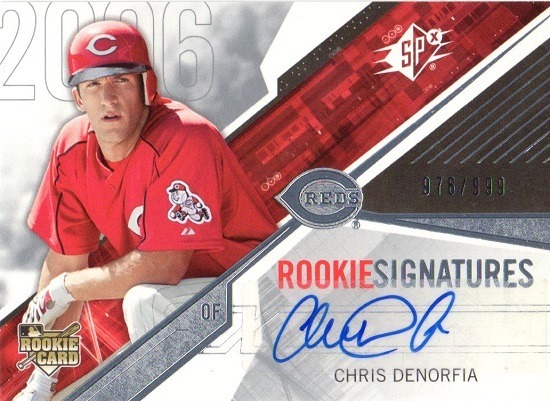 I recently sent a few Pirates cards over to Bob Walk the Plank, and he responded with some awesome Reds certified autographs. Mike Leake (who now wears a Cardinals uniform) Chris Denorfia (who was released last week after spending the spring with the Yankees), and Tony Cingrani (who is actually still a Red). I did not have any of these cards already, so they are definitely appreciated! Thank you Matt! With a 43-day turnaround, I added two autographed Joe Oliver cards to my collection through the mail. The former Red autographed both cards I sent to him (1991 Kahn’s and 1993 Upper Deck) with a fantastic looking signature. Oliver was a second-round draft pick for the Cincinnati Reds in 1983 and made his big-league debut in July 1989. He was the catcher for the 1990 World Championship team and spent eight of his 13 seasons with the Reds. The remainder of his major league service was split between Milwaukee, Detroit, Seattle, Pittsburgh, the Yankees and Boston, and also spent time in the Tampa Bay organization. His career came to an end in 2001 after amassing 102 home runs and 476 runs batted in and a .247 batting average in 1076 games. An interesting note: Oliver’s most similar player was the catcher he replaced in Cincinnati, the late Bo Diaz. I sent Terry McGriff some cards to sign about three years ago, and they came back a month and a half later autographed. I had three more to send, but I’m a grand procrastinator. Finally, in January this year, I sent the rest and in just three weeks received them back with his signature. Excluding glossy and Tiffany versions, McGriff only has seven different Reds cards…and I have them all signed. The best team-specific museum in the world is hosting Fan Appreciation Day this coming Saturday, featuring discounts on admission, door prizes, and free autographs. There are also activities for kids who attend. The autograph schedule is below; visit the Reds Hall of Fame for more information on all activities. 12:30 – 1:30 – Author Mike Lackey signing copies of his new biography of Bob Ewing, Spitballing: The Baseball Days of Long Bob Ewing. Reds Hall of Famer Jim Maloney and former All-Star catcher Johnny Edwards signed autographs for fans at the Reds Hall of Fame before the Reds-Mariners game on Saturday afternoon. The line was much longer than I expected, but the players were gracious and smiled as they signed their names to baseballs, photos, cards and more. My wife and oldest son went with me, and we were able to secure three Maloney autographs. I love how the pose is almost identical on every card. His 1964, 1965, and 1968 cards are very similar as well. The timing couldn’t have been better, coming just days after Homer Bailey‘s second no-hitter. Maloney was the last Reds pitcher to toss multiple no-no’s, and Edwards was his catcher during the first one. Thanks to the Reds Hall of Fame for organizing great events like this, giving us an opportunity to learn about the franchise’s past. Maloney and Edwards at the Reds Hall of Fame this weekend! 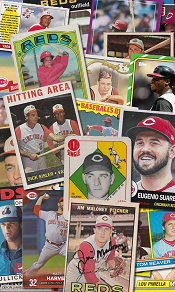 Gold Glove catcher Johnny Edwards and Reds Hall of Fame pitcher Jim Maloney are scheduled to appear at the Reds Hall of Fame this Saturday from 1:30-3:30 to sign autographs for visitors to the museum. Maloney is one of only three Reds pitchers to toss two no-hitters in his career (along with Johnny Vander Meer and Homer Bailey). Edwards was on the Reds 1961 World Series team, won the Gold Glove award in 1963 and 1964, and was an All-Star from 1963-1965. Edwards was the catcher for Maloney’s first no-hitter in 1965. In my never-ending quest to obtain an autograph on every 1984 Topps Reds card, Kelly Paris got me one step closer today. This request was sent out at the end of October 2012, and was returned to me today with both cards signed. 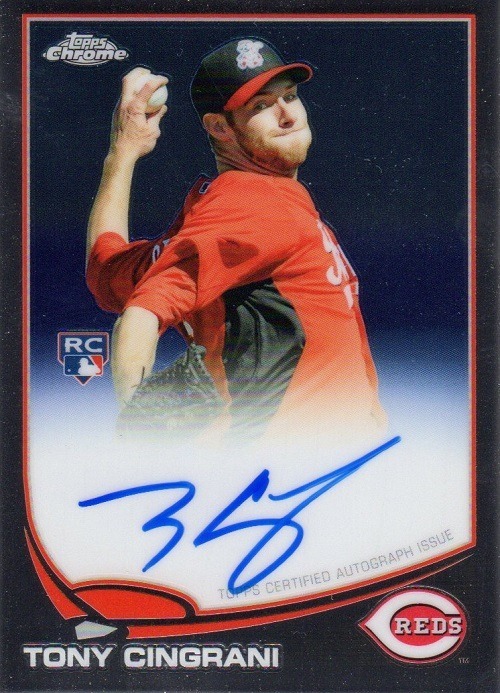 This is now the thirteenth card out of thirty-three (including the traded series) that I have obtained with an autograph. There are a couple that I know will be near-impossible, and I am resigned to the fact that I will likely never have the entire set signed, but it’s a fun project nonetheless. I am not trying to get all of my 1984 Fleer cards signed, but they are nice-looking, aren’t they? This is the second 1984 Fleer autograph I have obtained (Charlie Puleo was the first). Chris Welsh only spent one season in a Cincinnati uniform, but he has become an extremely popular broadcaster for the Reds. He has actually been calling games since 1993, which kind of blows my mind. I had no idea he had been in the booth for that long. I actually enjoy Welsh; he’s no Joe Nuxhall, but he gives an insider’s insight to the game in a non-annoying way (very much the antithesis of Jeff Brantley). I would love to get the entire 1986 Texas Gold set signed, but that will be impossible for two reasons: Pete Rose has three cards in the set and is way too expensive, and Bo Diaz has passed away (RIP). For a stadium giveaway, the 1986 Texas Gold set is very nice and clean and has some decent photos, especially for the time period. A lifetime Red and member of the 1990 World Championship team, Ron Oester got me a step closer to getting all the 1985 Donruss Reds cards signed. 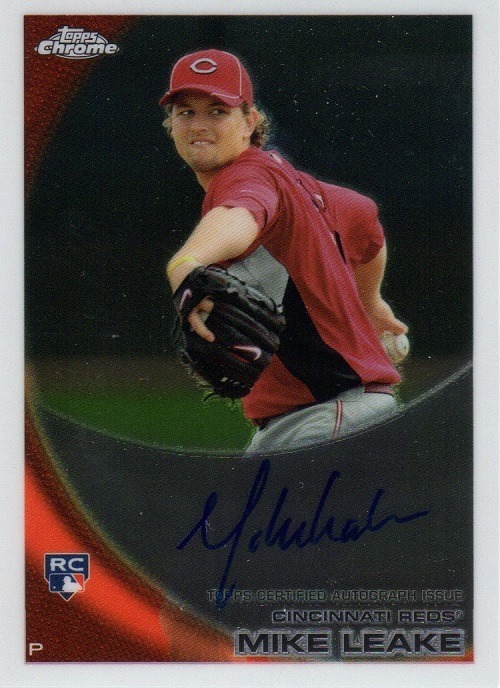 This is my ninth card from that team set signed.